Bearcat Explorers experience destinations near and far! Alumni, parents, and friends are invited to join us on the upcoming trips. At any point, feel free to contact the office at 503-370-6430, or email the trip contacts listed below. This trip is a combination of the Canyonlands of the Southwest and the Wild West Adventure trips. See info on those individual trips below. In response to numerous requests, we are finally offering alumni and friends the opportunity to enjoy one or both eight-day trips which will cover the Grand Canyon, Lake Powell, Bryce and Zion Parks in the Southwest, followed by another eight-day excursion through the national parks from Jackson Hole, Wyoming to Rapid City, South Dakota, including Yellowstone and Mount Rushmore. Vantage Deluxe Travel will be our tour operator for these trips. Their trips are known for excellent itineraries and great value. If you have traveled with Vantage during the previous two years (Croatia in 2017 and Canadian Rockies in 2018), you will be entitled to discounts (3% of Croatia trip cost; 5% of Canadian Rockies trip cost). Additionally, Vantage offers a 10% discount if you pre-pay for the trip a year in advance, with lesser discounts thereafter. See the details for each individual tour below. This trip is the first leg of America's Majestic National Parks trip. See below for pricing for this trip alone and when combined with the Wild West Adventure. 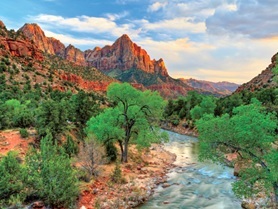 The first Saturday-to-Saturday leg of this tandem tour of great national parks of North America follows the classic route from Scottsdale, Arizona to Las Vegas, Nevada with highlights including a visit to Sedona, a train ride on the Grand Canyon Railway, a cruise on picturesque Lake Powell, a float trip on the scenic Colorado River and a visit to the spectacularly beautiful Zion Canyon. Along the way, we will experience seven sightseeing excursions and five cultural discoveries, while staying at deluxe hotels and lodges. This trip is the second leg of America's Majestic National Parks trip. See below for pricing for this trip alone and when combined with Canyonlands of the Southwest. The second Saturday-to-Saturday leg can also be done individually or in tandem with the Canyonlands tour, beginning in Jackson Hole, Wyoming and ending in Rapid City, South Dakota. 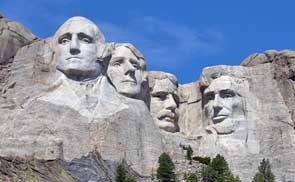 Highlights will include a float trip on the Snake River, extensive viewing of the world’s first national park, Yellowstone, the Buffalo Bill Center in Cody, Wyoming, the Devils Tower (first U. S. national monument named by Franklin Roosevelt) and the amazing Mount Rushmore lighting at night. This tour includes 10 sightseeing excursions and four cultural discoveries, as well as the aforementioned deluxe hotels and lodges. Please contact Kim Burris in the Alumni Office (kburris@willamette.edu or 503-370-6430), Jim Booth (jbooth@willamette.edu or 503-910-3192) or Cheryl Sheehan at Vantage (csheehan@vantagetravel.com or 866-786-2006, ext. 7147) for more information or to deposit. America's Majestic National Parks (both Canyonlands of the Southwest and the Wild West Adventure combined) - $7,198 (with free airfare!). Canyonlands of the Southwest - $3,499 (+airfare--$499 from Portland). Post-trip option: Two nights in Las Vegas for additional $499. 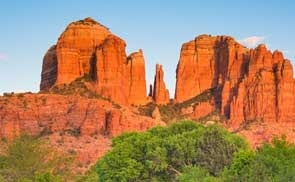 Wild West Adventure - $3,699 (+airfare--$749 from Portland). Pre-trip option: Two nights in Jackson Hole for additional $799. There are few places on the planet more interesting and beautiful than Italy and the Eastern Mediterranean. This trip will feature a luxury cruise at an exceptional price. Go Next will be our tour operator on the Oceania Five-Star cruise ship Sirena. Join Jim Booth ’64 and his wife Sandy on what may be their final trip for alumni and friends of Willamette. The cruise begins in Rome (although some may wish to start a week earlier from Monte Carlo) and just gets better as we enjoy the beauty and history of Sorrento & Capri, Sicily (Taormina), Corfu, Gythion, Mykonos, and the biblical bucket list site of Ephesus and Dubrovnik before finishing with two nights in the unique and historic city of Venice. 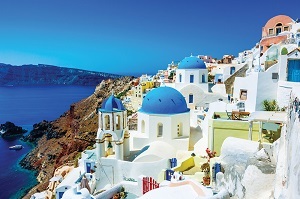 To add to the value, Oceania is offering free air, unlimited Internet and a choice between a $600 shipboard credit, six free shore excursions or a free beverage package (per stateroom). In addition, you will enjoy the camaraderie of the group at two cocktail parties along the way! We expect space to go fast (already half of the trip has been sold as of 4/10/18), so contact Kim Burris in the Alumni Office (503-370-6430 or kburris@willamette.edu), Jim Booth ’64 (503-910-3192 or jbooth@willamette.edu) or Barb at Go Next (bduoos@gonext.com or 952-918-8949) with questions and/or deposit. Travel to the Big Apple and join fellow Willamette alumni for an unforgettable experience touring the city's legendary theater scene. 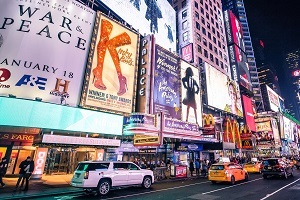 Along with a five-night stay at the Belvedere in midtown Manhattan, travelers will enjoy five exceptional shows (four on Broadway and one off Broadway), three intimate post-performance discussions with New York arts professionals and a private tour of the best art galleries in New York's chic Chelsea district. On top of all that, the trip also includes daily gourmet breakfasts, a welcome and farewell dinner and a private coach to take you to and from shows and events. This experience is truly a theater lover's dream! This trip will be led by award-winning playwright, screenwriter, film director, actor and founder of Insider Cultural Tours James Ryan. Mr. Ryan is the former chair of the graduate dramatic writing program at the Actors Studio/New School University and he teaches in the graduate dramatic writing program at Rutgers University. He is the recipient of fellowships from the National Endowment for the Arts, New York Foundation for the Arts, McKnight Foundation, and the Drama League Award. For additional information, contact Kim Burris in the Alumni Office (503-370-6430 or kburris@willamette.edu). Cost: $3,995 per person double occupancy (airfare not included) Single supplement is $858. See complete itinerary and details here. 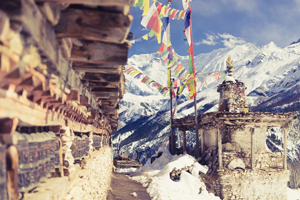 Join us for an adventure unlike any other through the legendary Nepalese Himalayas. This journey is one of the most accessible yet least visited of the trekking routes in Nepal, complete with beautiful vistas, picturesque villages and celestial peaks. Your trip begins with a sightseeing tour of the stunning city of Kathmandu, the heart of Nepal’s culture, art and religious life. You’ll then travel to the tranquil town of Pokhara to launch your five-day trek, where you will visit remote villages, experience magical sunrise views and meet the people of Nepal through a homestay. Click here to view a full itinerary and some spectacular photos of the region. This trip is for those who truly want a unique Himalayan experience off the beaten path! For additional information, contact Kim Burris in the Alumni Office (503-370-6430 or kburris@willamette.edu). Or call Carrie O'Callaghan '00 at Embark Exploration Co. (503-922-1050) for more details, information and to make your deposit. Cost: $3,325 per person (accommodations, all meals on trek, trekking guides and more). Tour Host: Embark Exploration Co.
Photo credit: Embark Exploration Co.
Join alumni, current students and theater professor Bobby Brewer-Wallin for our annual trip to the Oregon Shakespeare Festival in Ashland, where we'll enjoy a group lunch and two spectacular plays at an unbeatable price! Professor Brewer-Wallin will give a brief presentation that will include a discussion on theme, costume design, scene design and how those elements come together to create magic on the stage. This epic play/rock concert thrusts us into the life of a young woman trying to piece together her family history thirty years after her father fled Cambodia. Featuring actor/musicians who perform a mix of contemporary Dengue Fever hits and classic Cambodian oldies live, playwright Lauren Yee brings to vivid life the Cambodian rock scene of the ‘60s and ‘70s, a movement cut short by the Khmer Rouge's brutal attempt to erase the music (and musicians) once and for all. This story is about survivors, the resilient bond of family and the enduring power of music. Reminding us of the joint power and legacy of art and culture, this American Revolutions commission by Paula Vogel returns home after acclaimed and award-winning productions across the country, including a Tony-winning run on Broadway. A spirited and revolutionary love story that celebrates Yiddish language and literature, Indecent charts the real-life controversy surrounding Sholem Asch’s play God of Vengeance and the Jewish artists who faced persecution when bringing it to Broadway in 1932. 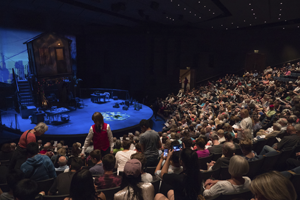 Directed by Willamette University Theater major Shana Cooper ’99, this collage of theater, music, dance and poetry is a heart-stirring affirmation of the impact of art in a time of chaos. We all want to have authentic travel experiences — not just visit a place, but really bond with it, connect with the people and the culture and come away feeling changed by the experience. And maybe we want to take another step and make a difference there, as well. For the third straight year, you are invited to join Willamette for an extraordinary travel experience that checks all of those boxes: be of service to students in a remote African school, really get to know the people in the community and then go on a custom luxury wildlife safari. The Mungere School, in rural Tanzania, is associated with the Red Sweater Project, founded by Ashley Holmer '02 to help kids in Tanzania get an education. Participants will spend five days volunteering at Red Sweater Project before going on a safari adventure. It just so happens that one of the most sought-out game-viewing locations in all of Africa is very close by. Cost: $4,495 per person double occupancy (airfare not included). Single supplement is $450. 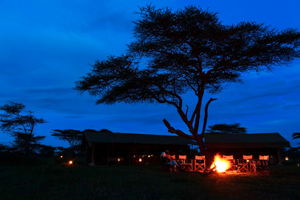 Includes all meals, accommodations and safari guides. Tour Host: Embark Exploration Co. (including Director of Travel Logistics, Carrie O'Callaghan '00). See complete itinerary, details and photos here! Discover the natural beauty and rich culture of Holland and Belgium on this nine-day river cruise. Step aboard a luxury cruise ship filled with delicious food and beverages, breathtaking river views and onboard activities. But travelers won’t just be staring at the shore from a distance — you’ll learn all about the rich history and traditions of the area through 10 included onshore tours and nine cultural connections. Whether you want to ride a bicycle through the streets of Amsterdam or take things at a slower pace, you can make your cruise as active or as relaxed as you wish. You may even want to extend your stay with optional excursions in Brussels or Amsterdam! The cruise begins in Amsterdam, with plenty of time to explore the city. Then, the group will tour a local tulip farm, visit museums in Arnhem and enjoy the architecture and cuisine of Antwerp. You will also see historic Bruges by foot and canal cruise. 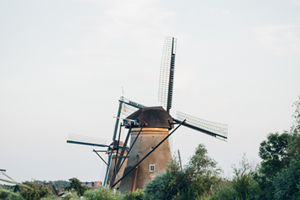 Finally, you won’t want to miss a day at the Kinderdijk windmills and the world-famous Keukenhof Gardens. Throughout the trip, you’ll enjoy time with the group at a special Captain’s Dinner, and Welcome & Farewell Receptions. For additional information, contact Kim Burris in the Alumni Office (503-370-6430 or kburris@willamette.edu). To reserve your spot, call 1-800-322-6677 (trip code VAA20). Cost: starts at $3,799 per person (airfare not included), with optional extensions in Brussels or London. Includes 26 meals, complimentary beer and wine, accommodations aboard a deluxe river cruise ship. Additional trips are currently being planned! Stay Tuned!